No, this is not an attempt to see if Darth Vader can regenerate to become Luke Skywalker's loving father, but as part of ' regenerative brake testing of Jop units overnight between Weymouth 460001 has also been borrowed. 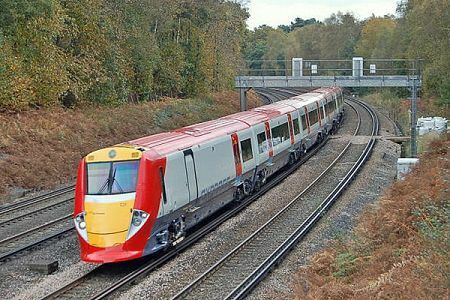 It is seen here passing Pirbright on its way to Weymouth on 23rd October 2008. 3 Cig 1497 and 4 Vep 3417 are also being used in the tests along with class 458 units.